WASHINGTON – The 2019 United States Mint (Mint) Explore and Discover Coin Set™ (product code 19XGB) will be available for purchase beginning on March 28 at noon EDT. This is the second of three new youth-oriented products the Mint is offering this year. These products feature the Mighty Minters™ —Kendra, Timothy, Sophie, Lina, Alex, Eli, and Layla— the Mint’s coin collecting ambassadors. The United States Mint Explore and Discover Coin Set is priced at $19.95. 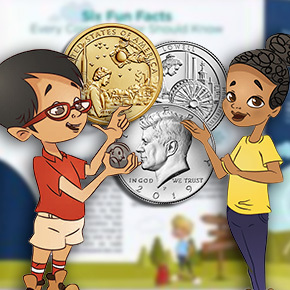 Orders will be accepted at https://catalog.usmint.gov/ and at 1-800-USA-MINT (872-6468). Hearing- and speech-impaired customers with TTY equipment may order at 1-888-321-MINT. Information about shipping options is available at https://catalog.usmint.gov/customer-service/shipping.html.